It's been a while now since I posted a stereoview. This one comes from the 1904 World's Fair in St. Louis, Misourri. 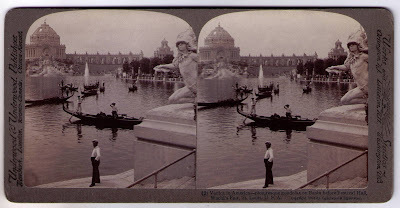 The 1904 World's Fair celebrated 100 years since the Louisiana Purchase. This was the second World's Fair hosted by St. Louis, the first one took place in 1884. As with several other American expos, the folks in St. Louis brought in gondolas. I haven't been able to determine exactly how many there were, but here in the stereoview image, we see seven or eight of them - some with two rowers. I don't see any seated passengers, and with the grouping, and the way the guys are standing, I'm guessing this was staged or posed. Of course back then, photography wasn't what it is today, and they probably had to hold very still for the shot. The impressive dome-structure on the left is the two hundred foot tall Festival Hall. On the right you can see the restaurant Pavillion. Festival Hall and the Restaurant Pavillion are connected by the Colonnade of States, and the gondolas are afloat in the grand Basin. As I've mentioned in previous posts, just about every architectural thing you see in this stereoview image was built out of a "temporary material" that consisted mostly of plaster of Paris with hemp fibers mixed in. None of the buildings in the photo still exist.